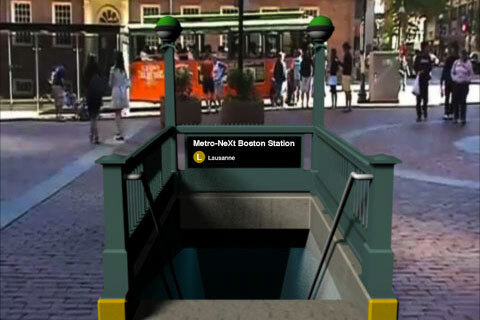 Metro-NeXt is a follow up to Martin Kippenberger’s Metro-Net, but rather than the entrance leading to nowhere, it leads to a virtual dimension, an augmented and mixed reality portal, linking cities together. 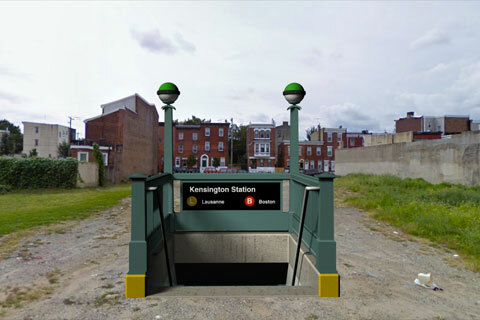 Metro-NeXt: Kensington Station, Philadelphia, U.S.A.
Merto-NeXt is a collaboration between French artist Caroline Bernard, American artist John Craig Freeman and Swiss artists Lalie Schewadron Pascual. Launch Metro-NeXt on your Android or iPhone Now. 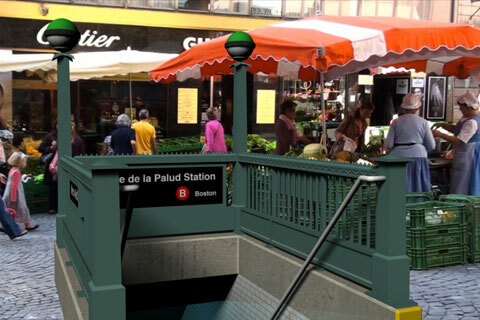 Digital media artist, Lalie S. Pascual received her MA in Fine Art at Central St. Martins University of the Arts in London, having being previously trained at Brandeis University, Massachusetts. Additional academic background includes a Master of Science in Management from Boston University. Her practice explores boundaries between the natural and the digital worlds through digital processes that synthesize data, images and video footage into new “states of existence”. She received a Brandeis teaching fellowship award in 2003, was a finalist of the Celeste Art Prize (London 2006) and she won the Drawing Conclusion competition by ArtSEEN journal in 2007. Recent exhibitions include the Helen Keller International Award in Glasgow, Lounge/Monika Bobinska Gallery in London, Gallery Lucy Mackintosh in Lausanne, the Boston Cyberarts Festival in Boston, the art science program of the Centre Hospitalier Universitaire Vaudois, the FPAC gallery in Boston, and at the École Polytechnique Fédérale de Lausanne. She is represented by Lucy Mackintosh Gallery in Lausanne. Née en 1978, nationalité française Professeure à l’Ecole de photographie de Vevey, elle a travaillé pendant 9 ans pour la Haute école d’art et de design à Genève (HEAD), notamment en tant que collaboratrice scientifique pour le laboratoire Les Formes de l’interactivité. Caroline Bernard est une artiste investie dans les nouvelles formes de cinéma, les images dites mobiles, et dans la vidéo interactive. Elle a conduit des workshops en France en Suisse, en Chine et en Ouzbékistan. Caroline Bernard is a professor at Vevey’s School of Photography. During nine years, she was a contributing scientific associate of the Formes de l’interactivité laboratory of Geneva University of Art and Design — Geneva. She is especially active in new forms of cinema, so-called mobile images and interactive video.